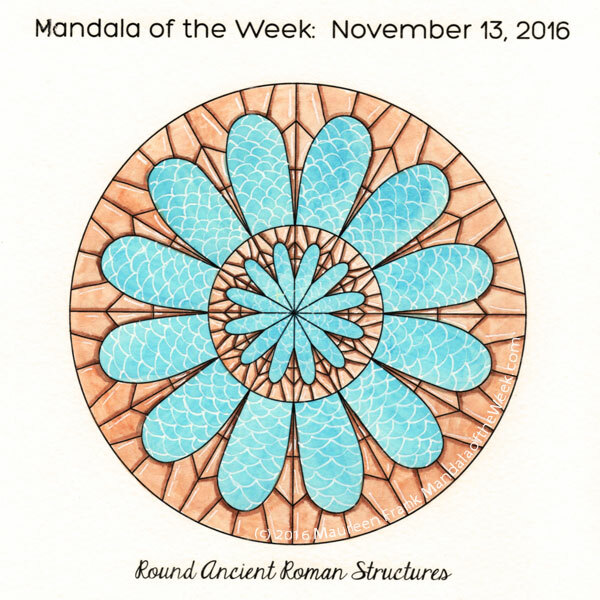 I present my coloring/painting of this week’s Mandala of the Week: Round Ancient Roman Structures (from Sunday’s MotD post). I decided to paint the arches a more realistic color and the background blue as if seeing the sky through the arches. Then I thought it would be fun to draw white “arches” over the blue. I used watercolors and a white gel pen. An archway represents strength, stability, lightness, and openness. Today’s mandala encourages us to connect with our own strength, stability, lightness, and openness.